Mr. Kim’s s youngest son, Kim Jong-un, was promoted on Sept. 28 to the rank of four-star general, a prerequisite for his ascendancy to power. The elder Mr. Kim, who is said to be in poor health after apparently suffering a stroke in 2008, has hurried the succession of his son in recent weeks. 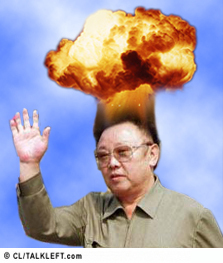 Here is North Korea's official statement of Kim Jong-il's death. Reuters has this timeline of his rule. Update: President Obama said tonight the U.S is going to hold "joint military exercises" with South Korea and is sending a carrier to the region. The purpose is to deter N. Korea attacks and " to signal to China that unless it reins in its unruly ally it will see an even larger American presence in the vicinity." Former President Bill Clinton has arrived in North Korea where he will attempt to negotiate for the release of Laura Ling and Euna Lee, two Current TV reporters jailed and sentenced to 12 years of hard labor. Scott Snyder, a North Korea expert for the nonprofit Asia Foundation, said Clinton's standing as a world statesman carried weight with Pyongyang. "The North Koreans have a lot of nostalgia for the end of the Clinton administration," he said. "The question is going to be how could he go to Pyongyang without some assurance that they would be released," Snyder said. "For someone at his level to go without a prior assurance of some kind would be to risk a huge loss of face." I think he'll do it. He rocks. Ling, 32, and Lee, 36, were arrested March 17 along the China-North Korean border after top officials in Pyongyang said they had encroached on North Korean soil while reporting a story on human trafficking by Kim Jong Il's regime. Laura Ling is the sister of tv personality Lisa Ling. Will that help her get released? North Korean labor camps are notorious for their high death rates because of malnutrition and overwork. But thus far, the women have been fairly well treated, housed in a Pyongyang guest house and allowed occasional telephone calls. The Swedish ambassador has also been permitted to visit them. President Obama responded in Prague today to North Korea's rocket launch. "I call on North Korea to honor its commitment to abandon all nuclear weapons programs, to abide by recognized norms of international relations, and to work to promote peace and stability in Northeast Asia," Obama said. What's behind the launch? A cry for attention? A message that Kim Jong il has recovered from his stroke and is still a big, bad force to be reckoned with? Apparently, the launch was unsuccessful and fell into the sea. The U.N. will meet today and discuss it, but further tough sanctions are not expected because Russia and China oppose them.